A 2-6 Player mini expansion connecting Small World to the Underground! This mini expansion contains 12 Tunnel entrance markers: 6 entrances pointing down from the surface of Small World toward its Underground, and another 6 pointing back up to the surface, thus allowing the two to connect. 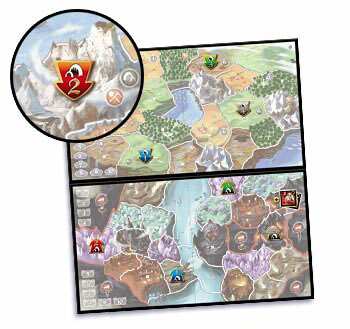 Small World Tunnels is a free, limited-edition expansion. Offer limited to one copy per order, while supplies last. Not a Complete Game. Small World and Small World Underground are required to play. It’s really nice that Days of Wonder gives this away free, but the price of shipping and handling made this item really not worth it. Its just a few arrows pointing up and a few pointing down. These are used to connect the above ground with the below ground. The rules to use the expansion can be read fron Days of Wonder web site and you can make your own arrows. I think this should just be shoved in the Smallworld Undergound box to save the headache. With that said, I really enjoy the connecting of two game boards and making a mega game, so hats off to the product itself. 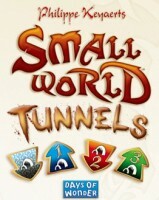 Add a Review for "Small World: Tunnels"